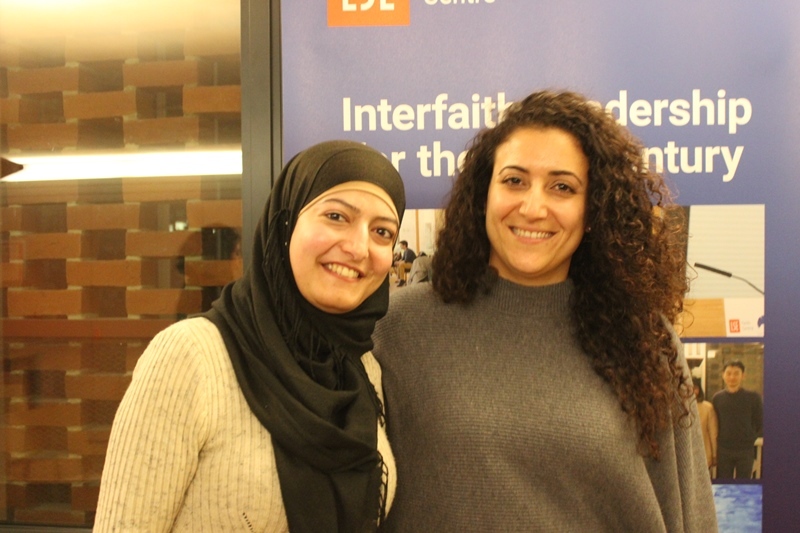 On International Women’s Day 2018, it seems fitting to reflect on one of the highlights of the Faith Centre’s events this term, hearing from Shaked Hasson and Amal Khayat, volunteers from Solutions not Sides about the role of women in building peace in Israel and Palestine, and drawing lessons for peacebuilding around the world. Shaked Hasson is a 28 year old Jewish student and activist, and the Leader of Young Labor’s Tel Aviv branch. During 2015 Shaked lived in Burundi for a year and established a project for female empowerment in the local area. Amal is a 28 year old Palestinian from East Jerusalem seeking a better future for both people through dialogue and not violence. At a time when the Israel-Palestine conflicts seems insoluble, with the two-state solution that has long been promoted as the only way forward seemingly unreachable, the friendship of Amal and Shaked provides a glimmer of hope, that there can be a new way of doing things in a new generation. Two main themes came out of their reflections above all: the role of dialogue, and the role of solidarity between women. In a region where the separation barrier and the entrenched fear on both sides means people are meeting each other and hearing each other less and less, Shaked and Amal spoke of the importance of not being afraid to engage in dialogue, to ask questions, to reach out to ordinary people, to understand their motivations, their reluctance and their fears and to take this loss of hope seriously. Ultimately both women have a deep understanding that the conflict is not black and white, and that the only way to move the conversation towards peace is to have the courage to listen to this with whom we profoundly disagree. They believe it is this refusal to listen across difference that has caused the impasse in Israel-Palestine. Women in their communities can be those who listen and hear, those who witness to the effects of conflict on the ground, and who can see some of the possible solutions for the future. This is true, and has been true, of women of faith in conflicts around the world, from Northern Ireland to Liberia to Colombia and everywhere in between. One barrier to this dialogue however can be language. Amal and Shaked touched on the constraints on women due to the boundary between Hebrew and Arabic; a society divided linguistically as well as religiously, socially and culturally. There is discrimination and stigma on both sides about learning Hebrew and Arabic, making it challenging for women to share their stories authentically in a common language. Amal and Shaked both do their speaking tours in the UK in English as a meeting point, a shared place even though it is not their mother tongue. For Shaked this is however not ideal. To truly understand people the aspiration should be to bilingualism, to hear and understand the other in their first language. People like Shaked and Amal cannot build peace alone. They spoke poignantly about solidarity between women and the need to see each other as partners in the process, and to be aware that each woman has different boundaries and constraints on their time, their life, their movements and their choices. For them, the vital decision is to see each other as partners in a shared struggle for a peaceful region, not to expect too much of other women, and to trust that each person can make the decisions that are right for them. Despite their differences of background and faith, Amal and Shaked are united by mutual experiences of being women, and their vision of a different way of building peace – one that involves hearing ordinary people and taking them seriously in any peace process. Overall, I was struck by the courage of Amal and Shaked as women living in the region, speaking from the heart about their struggles. But I was also struck by their realism that Israeli and Palestinians are in this together and that women have a vital role to play in the future of peace in the region. It is time that the voices of women of faith like Amal, Shaked, and so many like them, are heard more loudly. It is on a day like today that we need to celebrate, support and magnify these voices. For more information on Solutions not Sides, check out their website.